It could never last. After a week of cold crisp conditions, it seemed almost inevitable that the weather would break just in time to scupper the weekend plans. Undeterred by the forecast of 50 mph winds on the Cairngorm plateau, Ian and Claire drove up to the ski centre early on Saturday with plans to walk to Ben Macdui. They decided against it before they’d even got out of their car and opted instead for a gentle 27 km stroll over the Ryvoan Pass from Glenmore Lodge, up Strath Nethy and back over an ‘incredibly windy’ A’Choinneach and Bynack More. They were the last back to the bunkhouse. Tim, Alison and Kenny did get out of their car but were uninspired by the prospects for climbing and headed up the Corbett of Geal-charn Mor west of Aviemore instead. On a different Geal Charn, south of Nethy Bridge, Kate chalked up another Corbett, in the company of Bill, Eileen, Allan, Harry and Tanya. Bill did well to manage anything after badly stubbing his toe on a chair leg in the night. Apparently the chair had been repositioned by Alison after Bill had gone to bed. The lengths that some people go to to get to the kettle first in the morning. Back in the northern corries, I met up with Fiona M and walked into Coire an Lochan with a vague plan to climb The Milky Way. Finding another party already on the climb, we opted instead for Iron Butterfly. An absorbing first pitch lead to easier ground on the second, and Fiona graciously handed back the lead for the short third pitch, allowing me to top out onto the plateau and into the teeth of the wind. We threw the ropes into the sacks and made a quick exit down the Goat Track into Coire an t-Sneachda. Somewhere down below us, Sara and Pete were stumbling around in the Rothiemurchus Forest after getting lost on a nature trail, while Nigel, having conveniently left his crampons at home, was left with no alternative but to shamelessly tick another Graham. Making the most of the extended cold period, he and Clare were able to skip over the frozen peat hags of Carn nan Tri-tighearnan and enjoy the only summit views of the day. After a cold day on the hill, some members took to the bunkhouse sauna to relax, which rather alarmingly involved throwing water onto an electric heater! For the rest of us, the evening was spent in front of the wood burning stove, cooking tea, drying gear, doing the Times crossword, talking about Radio 4 and listening to Alison tell the Tiso’s rock boot saga... again! Clearly this was all a bit middle-aged for new members Tanya and Clare, who headed out to the pub in the company of the other Claire. We can only speculate as to the topic of conversation. Another early start on Sunday saw four teams head out into a cold and frosty morning for some winter action. Tanya climbed Sgor Gaoith, her first Munro, with Claire, Nigel, Ian and Clare. Unfortunately there were no views from the cloudy summit and the wind was still quite strong. Claire took a sledge for the descent and managed a run of about 150 m, surprising a few ptarmigan and hares in the process. Their day ended watching the rugby in a greasy spoon in Newtonmore. In the Monadhliath Mountains black ice caused problems for two of the other groups. Bill and Eileen had to abandon their plans to climb Creag Dubh after a few interesting minutes sliding backwards on sheet ice on the Glenballoch road above Newtonmore. In the end, they decided to walk locally from the village. 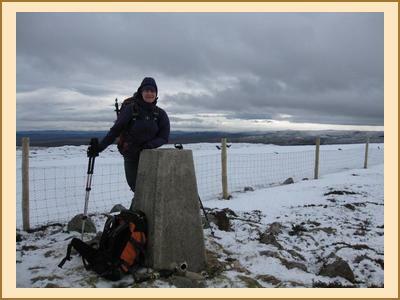 Despite needing crampons for the car park, Allan, Kate and Harry did manage to climb Carn an Fhreiceadain above Kingussie, and they had an enjoyable walk, mostly out of the cloud and even enjoying some sunshine. As is so typical of walks in the Monadhliath, wildlife was seen in abundance including grouse, ptarmigan and hares. The climbing party followed an excellent path from the Sugar Bowl car park, through the Chalamain Gap and into the lost world of the Lairig Ghru. 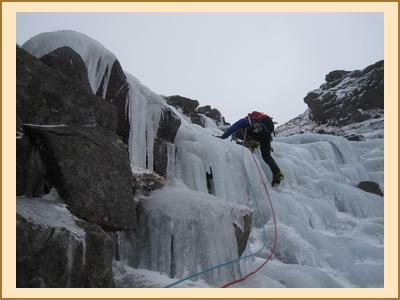 The destination was Lurcher’s Crag and we were after ice, following a post on Andy Nisbet’s Facebook page about excellent conditions on North Gully. Unfortunately lots of other climbers had also seen the post and with some of the other gully climbs thin or incomplete, everyone seemed to be heading for North Gully. Mike and I decided we didn’t fancy following a team of three unknown climbers up North Gully, so we opted instead for the neighbouring icefall. We climbed excellent water ice and Mike found unequivocal evidence on pitch two that mountain hares can climb grade II ice! The climb is unnamed in the guidebook, but rather unimaginatively called Right Hand Icefall by some. How about ‘White Rabbit’ (as in the killer rabbit from Monty Python and the Holy Grail) instead? Alison, Kenny and Tim braved the crowds and enjoyed three pitches of fantastic ice on North Gully. At one point, there were apparently 15 people climbing two parallel lines in the gully. Curse the Internet! As I headed back down the A9 with my eyelids propped open on cocktail sticks and my wheels on the rumble strip, I reflected on another memorable winter meet. We may not have had the big dumps of snow of the last two years but we seem to be enjoying a reasonable winter nonetheless and its far from over yet.